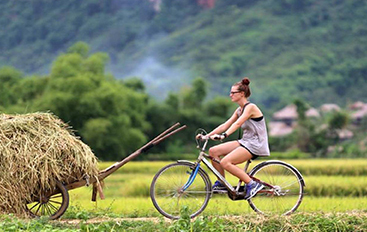 Travel 3.5 hours along winding roads through picturesque scenery and over misty mountain passes to reach the green valley of Mai Chau, an area of outstanding beauty and cultural interest. There is nothing quite like enjoying life with beautiful scenery in early morning. Through that trip, tourists also have an insight into the lifestyle of H’Mong people and experience their customs and culture. 11.30: Arrive in Mai Chau, take time to visit Poom Cong village and surrounds. 12.30: Local lunch at the house on stilts of H’mong people. 14.00: Enjoy a light trek to visit Lac Village and Van Village of Muong and Thai people. 18.00: Back to the local house, have dinner and enjoy traditional music show (optional). 06.00: Optional activities to wake up early to enjoy the fresh air. 07.30: Breakfast is served at the house. 11.30: A savory lunch will be served. 13.00: Leave Mai Chau. 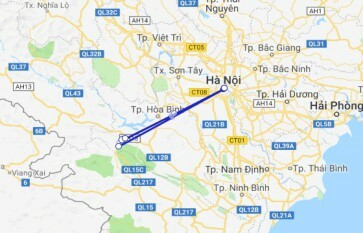 You will arrive in Hanoi at around 17.00. What an amazing recommendation from a friend. I travelled alone but an excellent guide was fab. Very in formative great humour and made the trip very interesting. The retreat was new but superb food and infinity pool. A great way to meet new people and easy to decide on a schedule. Well worth the trip. Mai chau biking was fun and the homestay with Vietnamese people felt very welcoming. Beautiful scenery and people in the rice fields are very happy to say hello. Nice place Nice place to see but on a two day trip. For one day it is to short stay and too long way to go with bus. The food is good, bike trip shows nice views around the town.